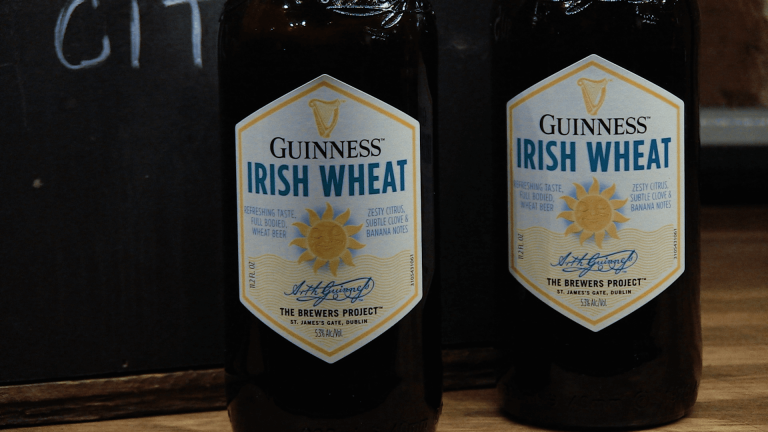 Guinness, best known around the world for their iconic stout, have been busy expanding their lineup. Irish Wheat, a lighter, citrusy brew made with Guinness ale yeast and local Irish wheat, has just launched in time for spring sipping. While the stout beer the brewery is best known for has a worldwide legion of fans, the dark, creamy style is not everyone's favorite pint. This new recipe has been released to appeal to those thirsty for something more effervescent, as well as fans of the stout who might be enticed to change things up. Kiwi Callahan and Alcohol Professor news were on the scene for the product launch, at 287 Gallery. She spoke with Chris McClellan, cicerone and Guinness Brewery Ambassador, about the beer. She also chatted with a few beer journalists on the scene about their reaction to this new style for the brewery. To learn how to pour a perfect pint of Guinness stout, please click here.